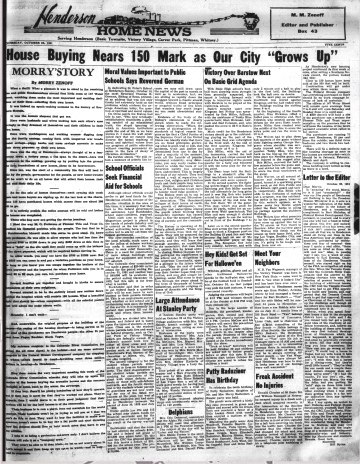 Originally published as a supplement in the Boulder City News, Henderson Home News became a separate publication in 1951. Like many local newspapers, Henderson Home Newschronicles the life and growth of a city in ways that larger newspapers cannot. It details events in individual residents' lives, from birthday parties to families' vacation plans. It covers local association activities, local political and economic issues, and includes advertisements by locally-owned businesses. This local focus and the fact that the area had been significantly populated for only 9 years in 1951 means that Henderson Home News traces a nearly complete history of Henderson’s development. This digital collection includes almost every issue of the Henderson Home News, including the supplemental issues published in the Boulder City News in 1949 and 1950 as well as the stand-alone issues published in and after 1951.